Mad Skills Motocross is the ultimate app simulation of the thrilling, adrenaline-pumping, experience of riding your motorcycle through rugged, cross-country terrain. It was released by Turborilla AB for an iPhone, iPod Touch, and iPad and costs $0.99. 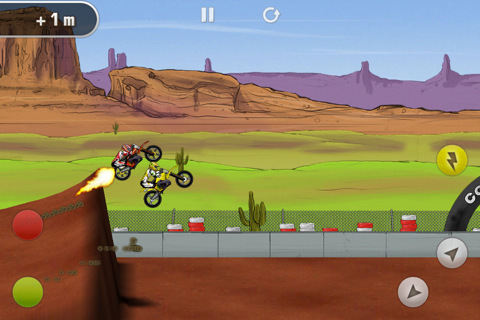 The app is an arcade-style racing game that puts the player on one of many tracks in a race against time and other motocrossers. The power of your bike is controlled by a green button, which is the throttle and a red button, which is the brake. To start your bike you hold down the green button and in Options you have the ability to position the buttons on the bottom left or right side of the screen. There are two different game modes, Career and Time Attack. In Career, you get the chance to rise up through the ranks as you go from level to level trying to win. In Time Attack, you get to go through all of the levels you have already completed and try beating your time. In Career you go around the track multiple times and in Time Attack you are only going around once. In Time Attack all of your time records are shown in winning order. There are five different divisions, 4th through 1st, and then a Turbocharged finale division. The game starts in the 4th division and once you have completed all 11 levels you get to unlock the 3rd division and so on. Once the challenge of doing tricks like a back flip is introduced, you get to meet with an advisor to help you get the move down before you start the race. Along with the throttle and brake buttons there is another set of buttons to control the rider’s placement on the bike. The buttons either pull the rider into the bike to sit low or push the rider up and forward. Depending on the jump you are attempting it is crucial to use those buttons to ensure that your rider will not take a tumble. Mad Skills is loads of fun and a great app in every aspect. Not only is the game highly entertaining, but there is an abundance of levels to keep busy with. 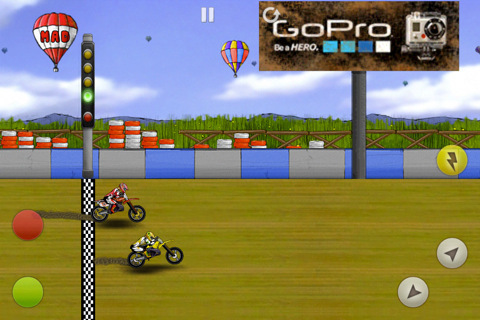 AppSafari review of Mad Skills Motocross was written by Vanessa Paszterko on February 1st, 2011 and categorized under Action, App Store, Featured, Fun, Games, iPad apps, Multiplayer, Racing, Time Management, Universal. Page viewed 4519 times, 1 so far today. Need help on using these apps? Please read the Help Page.